Updated Thursday November 29, 2018 by Stanley Park Optimist Club. 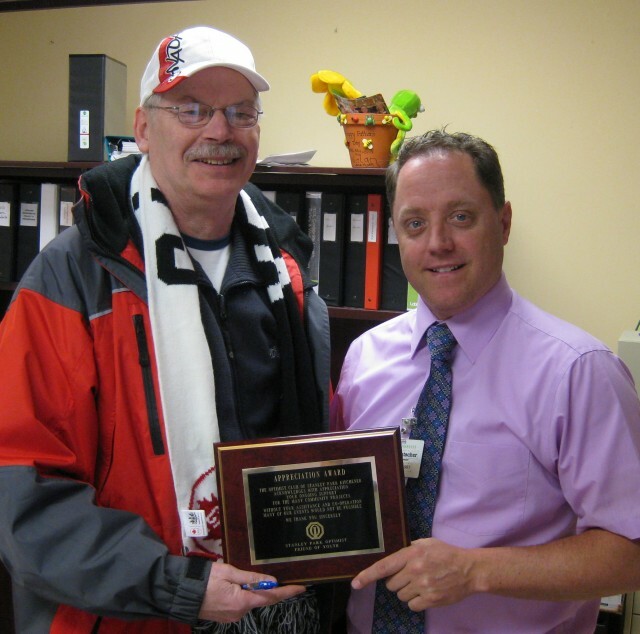 PHOTO: Zehrs appreciation plaque presentation, Feb.13, 2014. Gord Dearborn (Chair of Stanley Park Optimist Ball) is shown with Brad Gutscher (Store Manager of Zehrs, Stanley Park Mall, Kitchener). Stanley Park Zehrs has been sponsoring teams in the Ball Program, the website, playing cards for the entire Ball Program and refreshments for the annual HotDog Day celebration and Bike Rodeo for years. The support from Zehrs, its management and staff, along with that of our many other sponsors, allows us to reach out to everyone in the community with affordable quality-programs. Website: The Optimist Club's site and the Ball site. Other sponsorships invited as per your interest in enriching our program for the participants. Sponsorship can usually be made "in kind" if that suits more than a financial transaction. We thank all those who have supported us in the past and hope you'll consider joining us in whatever capacity best suits your situation. We'd like to hear of your interest in helping us. Please use the appropriate link on the "Contact Us" page and we'll follow-up with you.